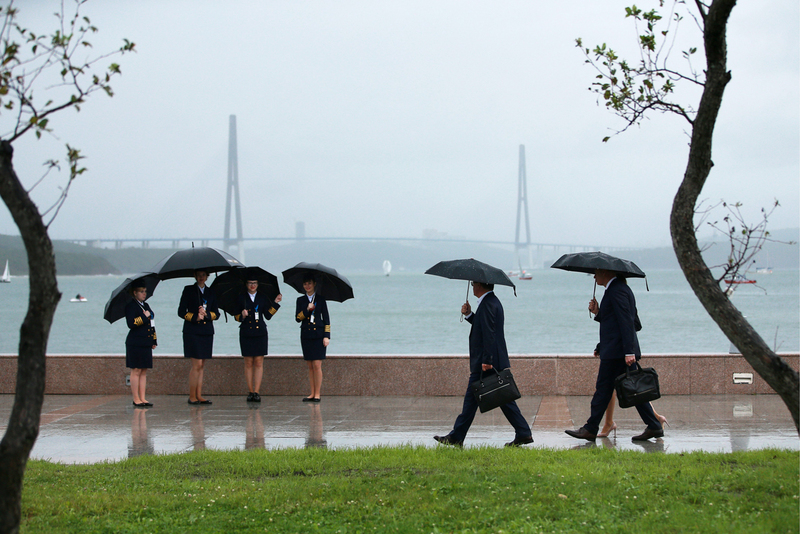 People hiding under umbrellas from the rain by the Ajax Bay ahead of the 2016 Eastern Economic Forum on Russky Island, Sept. 1, 2016. In the new Russia Direct report, top experts explain why Russia needs to retool its approach to reinvigorating its Far East. They also give advice to potential foreign investors in the region. In an effort to make Russia’s pivot to the East a success, the Kremlin is doing its best to attract investment to the distant regions of Siberia and the Far East. Vladivostok, as they see it, has every chance to become one of the centers of business, trade and innovation in the Asia-Pacific region. But how realistic are those plans? Given the current economic crisis, how might Moscow be able to attract substantial investment to the Far East region? How will such factors as the U.S.-led Trans-Pacific Partnership (TPP) influence Russia’s ambitious trade projects in the region? The new Russia Direct report, titled “Crossing the Bridge to the Far East,” brings together prominent experts from Russia and abroad to help answer these questions and find out what factors the government in Moscow should take into account as it plans the next stage of Russian economic development. Alexander Gabuev, senior associate and chair of the Russia in the Asia-Pacific Program at the Carnegie Moscow Center, starts by analyzing the obstacles and difficulties facing Russia’s pivot to the East and shares his take on what the Chinese and U.S. trade initiatives – the Regional Comprehensive Economic Partnership (RCEP) and TPP, respectively – might mean for Russia in the region. “What the Kremlin lacks is a strategy, which would include a detailed mission statement of both the Asian dimension of Russia’s foreign and economic policy, as well as the role it wants the Far East to play,” he writes. Paul Lirette, senior economist at the Warsaw-based Center for Social and Economic Research (CASE), raises another important point. Given the challenges related to integrating into the Asia-Pacific market, any pivot needs to take into account any potential changes in Russia’s relations with the West. In short, will Russia still be as interested in Asia if Western sanctions are lifted? A key pillar of Russia’s turn to the East is energy and there are already a number of ambitious projects being developed and discussed. Konstantin Simonov, director general of the National Energy Security Fund, outlines Russia’s difficulties in satisfying the demand of the Asian energy market and names concrete projects that are already being implemented with the participation of partners from China, Japan and the West. The report also features exclusive interviews with the Eurasian Development Bank’s Chief Economist Yaroslav Lissovolik, the General Director of the Far East and Baikal Region Development Fund Alexei Chekunkov, and the President and CEO of the American Chamber of Commerce in Russia Alexis Rodzianko. These prominent economists and practitioners share their views on the factors affecting investment activity not only in the Far East, but also in Russia in general. They also explain why Russia’s Far East might become one of the global centers for technological innovation and intellectual property. Not many are familiar with the fact that Russia and the U.S. once successfully cooperated in Siberia and the Far East, boosting trade between the countries and encouraging visits from America’s West coast to Russia’s Eastern regions. The overview of this positive period in Russia-U.S. relations is provided in the report by professors from the Russian State University for the Humanities in Moscow and the European University at St. Petersburg – Victoria I. Zhuravleva and Ivan Kurilla. They touch upon the historical significance of the Trans-Siberian railway for Russia-U.S. cooperation, the ambitious plans to connect Chukotka and Alaska that were never implemented, and the significant media coverage that Siberia received in the U.S. a century ago. How will the TPP influence Russia’s pivot to the East? What are the opportunities for Russia’s Far East to cooperate with America’s West Coast? Download the report and find out.